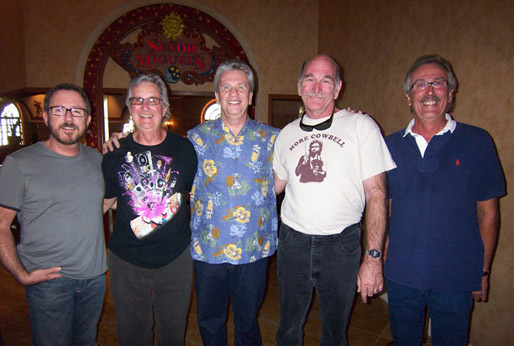 I missed the big show in Las Vegas last week, but here’s a report of the latest reunion with Jack Ely & the Courtmen. This was the quintessential “geezers night out.” Jack Ely and The Courtmen, revived after 42 years, was having a ball. It was great to see everyone again and talk about times that no-one remembered the same. lol We had great camaraderie then and we still had it. The playing wasn’t perfect, but who thought it would be after just 3 short rehearsals. Our only complaint was that the time went by way too fast. Now everyone wants to do it again. I don’t think we can wait another 42 years, though. Here’s what the guys look like, from left to right: Clif Evens, Jack Ely, Daryl Robin, Gordon Hirsch and Billy Triutt. 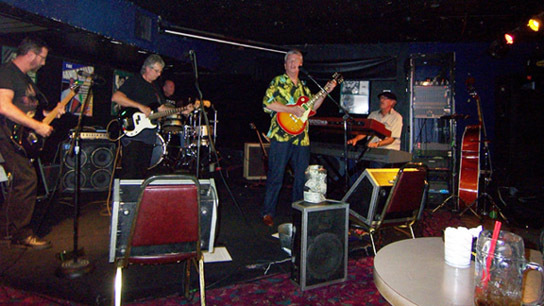 The Sand Dollar Blues Room is a great place to see some great music. It reminded me a lot of some of the hole-in-the-wall blues clubs I used to visit often in Chicago. Apparently Billy Truitt was the guy who suggested this locale and it couldn’t have been a better choice. The Wednesday house band, The Ruffnecks, are abso-freakin-lutely excellent. Fabulous look & sound and some authentic blues music coming out off the stage. Jack & the Courtmen looked and sounded like they were having a blast and everyone in the crowd felt it as well. A tight set with Louie Louie as the obvious bookends. Some hopping on the dance floor throughout the set, which included such tunes as ‘Money (That’s What I Want)’ and ‘David’s Mood’ (the B-Side to the ‘Louie Louie ’66’ record by the band. Thanks to Jack Ely & the Courtmen for coming out to do a a show filled with history, fun, and of course – classic music played by pros. 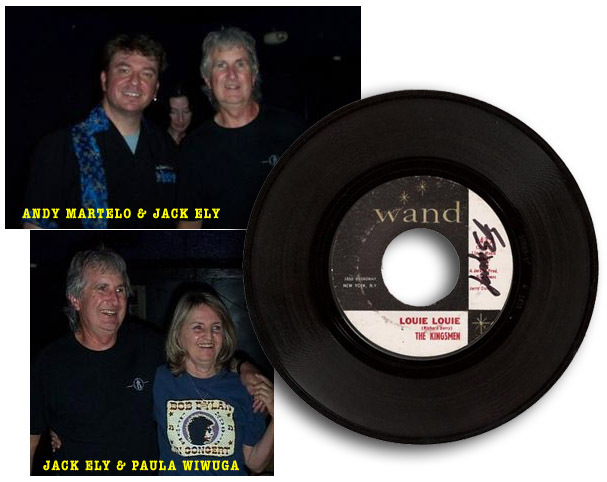 Andy also shared some photos of the event, including a picture of Jack meeting Paula Berry Wiwuga, mother of three beautiful daughters with Richard Berry.